Joy reigns in our household today at the sweeping Obama presidential victory. We are giddy with hope, almost not believing that it is true. God Bless America for choosing hope over fear, and change over the same failed policies and politics. I have been feeling too much like a tired, old cynic and I am proud that we, as a country, have taken a profound step in the right direction. My voting day was uplifting and tearful in turns. My three kids went to the voting booth yesterday with my husband and me. My 13 year old son stood in line and cast ballot with me for the first time since he was little. My nine year old is now an old hand, as she goes to every election with her dad on the way to school. My three year old thought we we were actually going to see Obama at the polls. (Oh, that's why she wanted me to wear a pretty dress. I complied) There was excitement and giddiness all over as people waited to vote, even in a place as "decided" as Brooklyn, New York. I called my mom who lives in Florida to hear her voting day plans (a dyed-in-the-wool Democrat, she) and to share the moment. I was sad to learn that Republican canvassers were at her door on Monday, chatting up my independent-streaked stepfather. Then I went to make calls for Obama, first at a Mega-Call center at the Brooklyn Academy of Music (BAM), then at home with that awesome online calling tool. When I had to stop making calls to do school pick up, I re-watched a couple of classic videos posted on The Daily Kos. I was hoping to feel uplifted and"fired up," but in fact, the images reduced me to tears. I was afraid that our country was not ready for Obama, no matter how great his promise. In the evening, we switched on the TV and followed the political web sites we've been obsessively checking for the past few weeks. The girls were conked out by 8:30pm. But my son held out longer, until about 9:20pm when Ohio was called. It was a positive enough omen for him, and he went to bed with high hopes. My husband and I stuck it out, relived that it was over by 11am. Barack's historic yet humble speech at midnight moving and prescient. The hard work is ahead. Still, the cheering and whopping and car horns blaring could be heard all over Brooklyn. Today is truly a new day. By chance, I had planned an All-American meal of hamburgers and French fries for tonight's dinner. But now it is definitely a celebration. 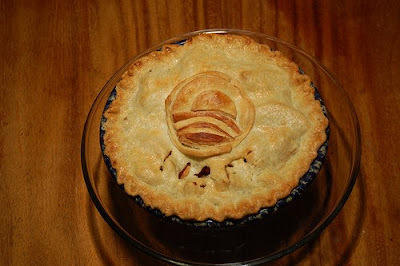 I may even pull together an apple pie, a family favorite and political symbol extraordinaire.